Dumbbells are truly one of the most effective ways to start your training session. 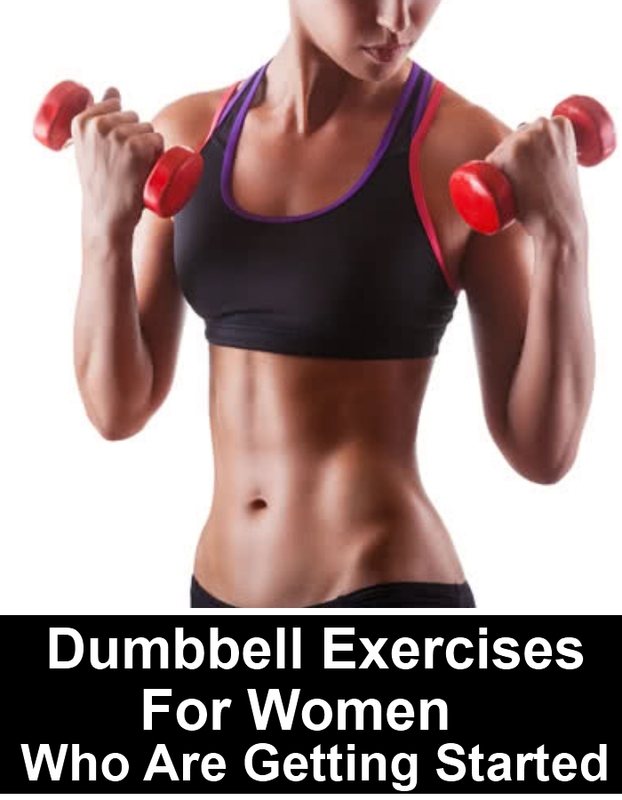 Women tend to shy away from dumbbell training, but it is to be noted that dumbbells are the way to training hard. They offer several benefits, especially when women are just beginning their training schedule. They help in stabilization, they help in building balance and contribute towards great toning and muscle building. Beginners need to start with easy exercises which help them to reduce imbalances and builds stamina, confidence, and endurance in the long run. Start the workout in a standing position, as your feet are kept directly under the hips. You shall hold a dumbbell in your hand. Your palms shall face out. Now, you need to slowly bend the elbows, as you move to bring the weights close to the shoulders. This shall be one curl. You will again stabilize your torso and move your arms a bit upward. Slowly straighten the arms just above you, as you work on an overhead press. Your palms can face out. Now, slowly bend the elbows and allow them to get back to end of the bicep curl. You can again straighten your arms and get back to the start position. Once done, you will be completing one repetition. You need to do 15 repetitions. You will be in a wide squat stance as you start the workout. Now, hold a dumbbell in the right hand and just in front of your knees. You will slowly drive your weight up. You need to keep it near your body. You will again thrust it with the hips. As your weight is about the height of your chest, you will slowly extend your legs. You can again get back to the squat position. Thus, your body shall be of the weight now. You can drive this weight overhead and in a complete lockout position. This movement should be done really quickly and quite explosively. This is another easy exercise for women. Relax and stand as you keep your feet a little distance from one another. You will hold a dumbbell in your hand. Slowly bend the elbows and move them just behind your head. 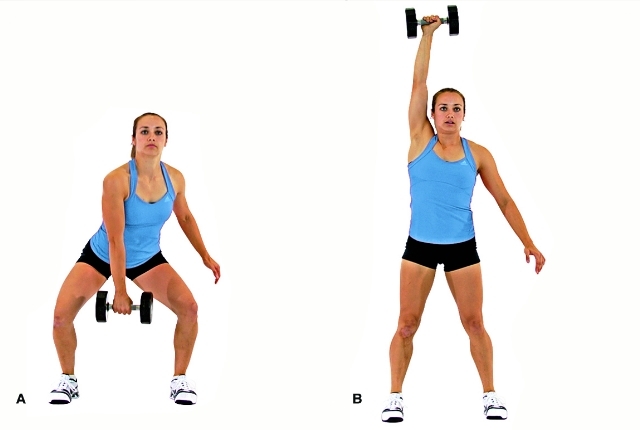 You can again straighten the arms slowly and move up the dumbbells in the air. Do not rush through the workout and do not strain yourself too. You will straighten the arms so that you are able to lift the dumbbell in the air. You can again bend your arms so that you lower them. This shall be one repetition. You need to repeat at least 15 times. This is a unique exercise where you start by lying down on your back. Your right leg shall be bent. Your left arms shall by the sides. You need to hold on to a dumbbell in the right hand and just above the chest. You will roll on the left and then prop yourself on the left forearm. Now, slowly straighten the left arm and you will raise the hips. You will push in a half kneeling position, as you move the left leg just behind the right. Now get up. You need to reverse to the start position. Once done, you will switch sides and repeat. You need to try and do 100 repetitions in total. This shall be 50 per side. For this workout, you need to start by leaning a bit forward. You will be bending both your knees. Your back shall be totally flat. Now, slowly extend the arms and have them completely straight. You will also have to lift your dumbbells straight up and move to the chest level. You will squeeze the shoulder blades as you do the movement. However, your elbows should be in and need to be pointed upward. Do not arch your back in this step. Now, in this position, you will slowly push the weight back and get back to the start position. This shall help in completing a single repetition. You need to do sets of 15 repetitions. Start the workout with your feet a little distance apart from one another. You shall hold dumbbells on your shoulders. You need to have a neutral grip. Your elbows shall be up. Now, you need to hinge a bit back, as your back is straight like you are sitting on a bench. You need to lower the body till the hips are just below the knees. You need to complete your movement as you drive through hips. You can get back to the standing position.